“Stop setting goals. Goals are a fantasy unless you have specific plans to achieve them”- Stephen R. Covey. Words by this topmost American management expert and motivational speaker aptly describe why people fail to achieve their goals. Indubitably, most of us go about our lives waiting for things to happen by natural course. Instead, we can fare far better in life should we have a realistic and achievable plan for our goals. Ironically, as students, we had specific goals. Scoring high at exams, excelling in sports, making new friends, developing a hobby were some goals we cherished as kids. Nobody needed to tell us what goals to set and how to achieve goals. It was spontaneous and we were successful to great extent. A lot of us would have been through immeasurable suffering caused by lack of money and resources, inadequate parental support or poor health during these formative years. However, we did achieve these goals to great extent, save for minor deviations from the stated objective. Sadly, this verve appears to abate as we grow older. Naturally, growing up comes with shipload of inherent vagaries. For most people, goals get relegated to the backseat upon finding great jobs. Shockingly, nobody taught us the importance of goal setting or about having goals in life. Hence, we are blank on how to achieve goals. Naturally, we are happy to work for a reputed organization and embark on a long career. But does this satisfy our goals in life? Noted Greek philosopher Epicurus once said, the ultimate goal in life of every human being is to be happy. Unfortunately, here lies the danger zone. Happy over job, career prospects and assurance of promotions coupled with financial wellbeing sounds the death knell of our future goals. Future looks stable and secure. Content, we slip into mundane routine. We pride in mundane achievements including marriage, parenthood, buying home and attaining some degree of respect in the society. Despite,we neglect the importance of goal setting. Several motivational speakers including Stephen R. Covey, Robert Kiyosaki among others have spoken extensively about the importance of goal setting. They suggest that life goals are very important. Reading books written by these eminent writers will give you great insights into the theory of goal setting. By far, complacence is the single-most killer of our goals. Complacence comes from that false sense of achievement. It deceives us into wrongly believing we have done our best. Complacence destroys our competitive edge. It is the archenemy of growth and pernicious for self developments. It deceptively guides us into thick walled comfort zone from where escape can be difficult. Hence, if you have already slipped into this hideous quagmire of complacence, it is high time you rethink your life and future. Sadly, self doubt and lack of confidence are the second stumbling block to attaining our goals. Surely, you may encounter doubts over various issues. These apprehensions can arise from various things. Financial status, family situations, insufficient experience at work or skills or sometimes, the mere thought of upsetting the apple cart created by complacency, serve to spur self doubt. Such self doubts or diffidence can be eliminated by a simple process. Firstly, take accurate stock of where you stand. Secondly, cast away unnecessary worries. Merely worrying will not eliminate money or family problems. Further, lack of skills can always be obliterated by training and practice. Upsetting the applecart in favor of uncertain, ambition-fuelled future can be a daunting thought. Eliminate self doubt by beginning to take calculated risks. Invariably, all of us experience drop in motivation during different phases of life. Lack of external stimulus such as feeling unappreciated at home or work, less disposable income due to debt burden and inability to counter chronic problems or illness for any reason are main culprits. However, you can overcome these easily by learning to pat yourself on the back. Reschedule repayments if you are encumbered by debts to enjoy the stuff you want. Further, you can seek help from medical or psychiatry professionals to eliminate any chronic problems. Frankly, how many goals have you set yourself other than casual New Year Resolutions? In all probability, the answer would be zero. Further, if you did set goals, some were abandoned midway due to plethora of reasons. To attain goals, you need to define what you want. Admittedly, it is very difficult to define goals. Broadly, we all want to be rich, happy and secure. However, we do not know how to do so. Failing to plan is planning to fail, runs an old axiom. Rightly so, most of us have only nebulous or obscure ideas about how we plan to attain our goals. For example, you may wish to become rich quickly. At the same time, you would not know how to get rich, the time span and resources you require. Therefore, planning to achieve your goals is of prime importance. Remember, without a plan, you cannot get anywhere. 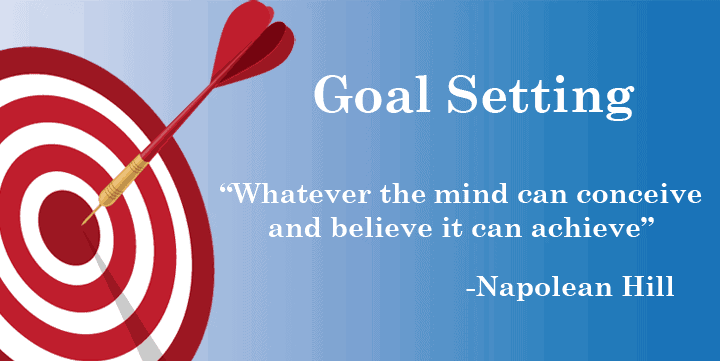 Below we provide some tips on how to effectively set goals and how to achieve them. Now this is something most people will shy away from. Most likely, you will have a great perception about yourself. This is insufficient at best. Taking your own inventory helps set life goals and shows how to achieve goals. Instead, you need to take a complete inventory about yourself. This includes your education and skills, finances, family, good and bad traits in your personality, present situation and just about every sphere of your life. There are three known techniques for self assessment. Career goals: About the post or position you wish to attain with your education and skills. Financial goals: How rich do you wish to get within a set time spans. Also include plans for investments and generating additional income. Personal goals: Deals more with personal life such as your marriage, having kids, buying house and other issues vital to your wellbeing. Social goals: Define the status you wish to achieve in your society or community. Basically, it means defining reasons for which others should recognize you. Spiritual or moral goals: This has nothing to do with gods and deities. It simply means your goals to become a better member of the community by eliminating vices or bad habits. Using abusive words is frowned upon and getting rid of the habit can also become a moral goal, for example. Remember, this is also an important goal in life. Understandably, you wish to do a lot of things. We all do. There is nothing wrong with that. However, you have only 24 hours a day. Therefore, whatever you wish to do has to be confined within this limited time. Time limitation is a great damper for goals. People cannot achieve certain goals because they provide too little time for getting there. Short term goals: Ideally achievable within six months to a year. Mid-term goals: Those you wish to attain within a couple of years from now. Long-term goals: Everything you want to have in the next two to five years. Distant goals: These are very long term goals such as owning a home. The process can take as long as 20 years, if you take mortgage or housing finance from lenders. Remember, the cardinal trick is to ensure you prioritize goals according to your existing abilities and resources. Most people fail because they base goals on anticipations, projected gains and vague possibilities. Letting your imagination fly occasionally is great. It helps explore new horizons. However, basing your goals on some vague future possibilities can be suicidal. Moreover, you may end up wasting precious time, money and other resources in pursuit of a mirage. This is yet another area where most of us fail quite miserably. Remember, goals are very easy to forget. Making plans mentally and implementing them daily are vastly different things. Hence, the best way to sort this glitch is by writing down your goals. You could write them on paper or your computer. Regardless, you need to read them daily to remind yourself. The process serves as some form of autosuggestion. Frankly speaking, writing your goals on a notebook is preferable. The very process of writing serves as a reminder. Also, you can tuck away the book in a safe place, away from prying eyes. Hence, nobody can derail your plans. Perhaps this sounds ridiculous. Yet, it is very important to have someone like a parent or mentor act as referee or independent judge for your goals. Their perception about you will definitely vary from your own. Further, age and experience gives them some advantage. This referee serves to assess your goals and if required, provide some guidance that may help redefine them. Often, such judges can offer insights that you miss. Further, you will also need independent assessment of the progress you made to achieve your goals. As we see earlier, there is only so much you can do within a day, week, month or year. Regardless of whatever your goals, you need to assess them periodically. Several factors around you can change after you have set your goals. These external factors can include political scenarios, new laws, better technology, money related issues, health and umpteen others. Therefore, draw a timetable for assessing your progress. Surely, you will find that progress has been faster on reaching some goals and slower in others. Moreover, you might not make any headway in attaining some goals. Thus, having a timetable for assessment helps you know where you have reached and what you need to do further. Undisputedly, this is a key element in goal setting. You need to review your skills as said earlier. Further, you need to be objective in these assessments. Meaning, you need to find out why your progress towards certain goals was speedy while it was retarded for others. The review done by your referee and self will help identify gray areas. You can easily eliminate those. Simultaneously, you can derive greater advantage from your strong areas and reach goals faster. Remember, these reviews are only for your assessment and guidance. Therefore, failure or slow progress should not make you abandon a great goal. Obviously, the biggest beneficiary of these goals is your family and yourself. Remind yourself of the rich rewards you will reap upon achieving your goals. This should serve as sufficient motivation to work towards their realization. Often, remaining motivated can be difficult. Small setbacks can upset you immensely. At such times, you can revert to your appointed referee for mentoring. Also remember why you embarked on the endeavor in the first place. Backing off is easy when undergoing motivation blues. Hanging on can be difficult but will prove to be the best decision you ever made. No, we do not speak about that popular eponymous pop song. Simply put, erase and rewind means, eliminate goals that seem absolutely unattainable. Surely, you will find some goals which just cannot be reached despite your best efforts. Therefore, it is best to eliminate them rather than waste resources further. That means erase. Rewind means, set up newer goals to replace those you just eliminated. It may take your life back a few months. However, your new goals will definitely be worth it. Your failures expose loopholes. You can effectively plug these and re-launch on another, superior goal. Fortunately, countless books authored by scores of motivational speakers, management gurus and successful personalities are available online. These books help you develop myriad, desirable skills, provide motivation, carry success stories and encouraging words. Investing a small amount on these books will prove worthwhile. Remember, aiming for dream goals should be pleasurable. You can enjoy this journey to success by adding some enjoyable moments with family and friends daily. Never remain tense over your stated objectives and goals. Instead, look upon them as excellent opportunities for self growth. Next articleI don’t Have Enough Experience for a Job. What should I do? can i work on android tab ptc please advise me ? Very inspiring and educative on goal setting and way of achieving them. Hi! My name is ChijiokeEneh from Nigeria. I’m a writer, I have about four books I’ve writen but my problem is lack of finance and sponsor to make any move with my creative writing. Please if there is any way I can get asistance I would be most appreciating.. The postulates are all good with respect to managerial advice but in reality , only 2 things work- hard work of the incumbent and integrity of the vendor. Sadly, the latter is hard to find. From my experience,whoever says that he earned money taking surveys or viewing ads. is clearly lying. I shall be happy to be proved wrong. Thank you for your daily guide. But you advise to join some of companies. such clixsense ,neobux etc. As per your advised i joined these concern i cannot earn atleast 1 dollar. but mentioned your article earn upto 100 dollar above. I totally upset from your article advise . do not mention next time like this 100 dollar above, people will be going to suffer. My goal is political leader. i enjoy this lecture and t has helped me now re-launch my goals and start on a fresh page. I will like you suggest to me online jobs that could help improve ones financial status. The best Excellent Goal setting . Well documented. Should be of help to many in planning their future. I am setting my goals because, I have a tendancy to set my plans. That’s why SureJob is not suitable for my lifetime job. Create a picture of where you want to be in life 10 years from now. Think about what you need to do in five years, in one year, and in six months to get to your long-term goal. Write down what you need to do each month to achieve your goals. I really learn from this.. This is really inspirational. Clear and straight to the point. Thank you a lot for sending this to me l really appreciate it .am going to put it in to practice. Am financially broke though but I have hope this is going to help me. Very wonderful goal setting, i just wish to request investment on plan with you because i have many plans but lack of investment,will you help me achieve my goals in life? Chân trọng bài viết của bạn. Thanks dear people of the team SUPER JOB . All the valuable tips described here are the fuel for many , who keep fighting with their beautiful lives without realizing the abilities hidden no where else but inside them selves . with my best Regards . it was motivative and helpful to me. hello ham in iran . The country that restricted by USA and have some problem in receiving mony paying by pay bal ,…, finally h can not work them and i am sourry for that…pleas tall me in regarding bitcoin because it is free activity…very thanks.